Located adjacent to historic Diamond Hill in Lynchburg, Virginia, the Presbyterian Cemetery was founded in 1823 when six elders of the local Presbyterian Church purchased two acres of land on Campbell Court House Road, now Grace Street. The land was purchased from Edward Lynch, son of Lynchburg’s founder John Lynch, and his wife, Mary. For Lynchburg’s most prominent citizens – merchants, tobacconists, attorneys, and others – the cemetery quickly became “the place to be buried.” In the 1860’s, it was expanded with the addition of a five-acre tract of land known as Maple Grove Farm. The land, which adjoined the cemetery, was given by the Tyree family in exchange for burial plots. The original two acres became known as “The Range” and for a brief period of time the “new section” was referred to as Maple Grove. Over the years, the cemetery continued to expand and today consists of approximately 18 acres and more than 12,000 gravesites. This outdoor museum of Lynchburg’s history has over 12,000 stories to tell. Presbyterian Cemetery’s history is intertwined with that of Lynchburg. Names from the burial books read like a who’s who of the city. Early local civic leaders, successful businessmen, professionals, immigrants, veterans and their families all can be found buried here at Presbyterian Cemetery. This beautiful outdoor museum boasts the most unique and elaborate tombstones in the area. As you stroll the grounds, you are transported through time with ornate examples of funerary architecture. One such example is our Angel of Grief or Weeping Angel, a replica of the one in Rome, Italy, created by sculptor William Wetmore Story. The Angel of Grief has become the very definition of sadness. The Presbyterian Cemetery serves as the final resting place for men and women who served in all branches of the military. There is a Civil War Trails marker near the main entrance, and throughout the cemetery one will find memorials and plaques honoring soldiers from the War of 1812 through modern-day conflicts. During the Civil War, Lynchburg was the second-largest hospital city in the state, behind Richmond. Thousands of soldiers were sent to Lynchburg to heal. Many did not survive. About 300 Confederate soldiers are buried in Presbyterian Cemetery, making it one of the largest Confederate burial sites in Central Virginia. Included in this group are Brigadier General Samuel Garland, Major General Robert Rodes, and 43 soldiers known only to God. Civil War Brig. General, Samuel Garland, Jr.
Edwin “Ned” Emerson, actor and confidant of John Wilkes Booth. Emerson was on stage when President Abraham Lincoln was assassinated by Booth. 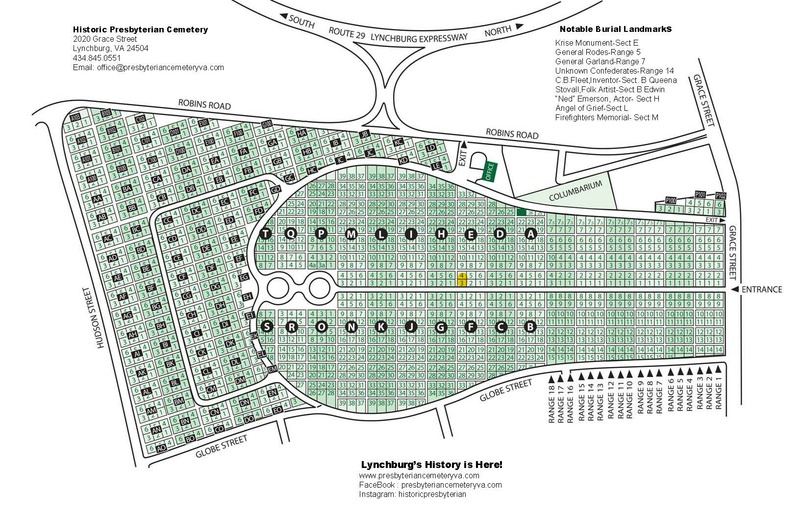 The Presbyterian Cemetery can help you find and plan the perfect resting place for you or a loved one. Our history and charm make Presbyterian Cemetery the choice of many citizens of Lynchburg and surrounding areas.